This post is for my blogging friends. 2015 seems to be the year of the video, specifically short clever videos that are easily viewed on social media. Yes this type of video has been around for a while but this year we are seeing it everywhere. 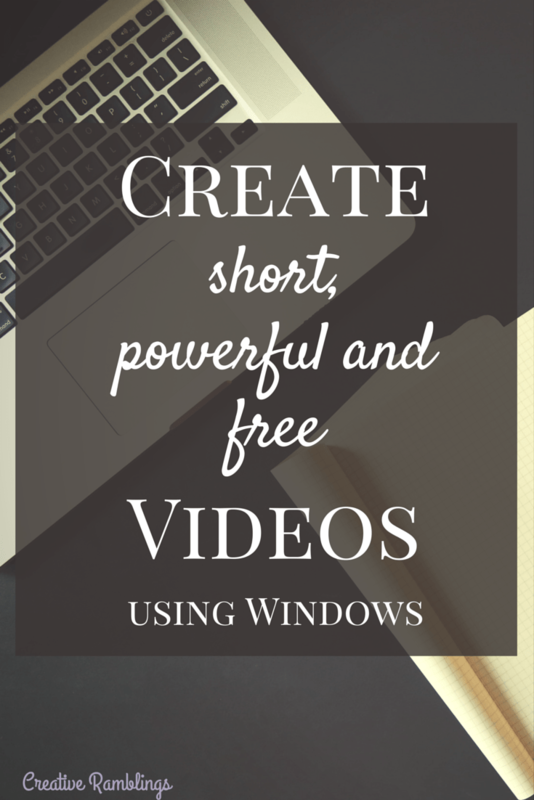 This post is all about how to start creating your own professional looking short FREE video with Windows. Why create short videos? How do they help my blog? Short videos are given preference on Facebook. They are shown to a higher percentage of your fans and in turn those fans like, comment are share your video. When fans engage with your content they are more likely to see future posts on your page. The hope is that as your engagement increases you will see more click-throughs to your blog. Brands ask for and produce their own short videos. If you can show that you are proficient in creating eye-catching videos that convey a message you may be better positioned to work with a brand on a social media campaign. They are fun! Fans love them. Forget pageviews and numbers for a second. Creating and editing video, for me, is often times more fun than writing the same post with just pictures. Once I post it (on my blog, YouTube, and social media) I love the conversations that arises with my fans. Stay true to your niche. What type of content do your fans come to you for? Camera. I use my regular camera (Sony Alpha ) to film video but you can also use your phone. YouTube. I use both, but you can do this with one or the other. How do I film the video? Get all your supplies ready and have them accessible. If you are doing a hands only video (see my examples) make sure everything is in reach. Do a couple of trials, while recording. Don’t worry about time or mistakes, record as much as you can. Take a few pictures of the finished product to incorporate into your video. How do I edit and make this video look professional? The following video walks you through the editing process of a short video using Windows Movie Maker. When I am finished with Movie Maker I have an edited video with an animation theme, a title, text, and appropriate speed throughout. I then upload it to YouTube to add music, links and more. It is from YouTube that I get a final product that I can share on social media. I value the views and interaction I get on YouTube and I like all my videos in one place. You can just as easily complete your video in Movie Maker and upload it to social media. YouTube allows you to easily add music and links to your video. You can easily add a YouTube link to your blog to embed your video without uploading it your blog. How to add music and links to a video in YouTube. You now have a professional looking video with music and clickable links that you can share everywhere! To get the most out of my short videos I share them directly on Facebook. Upload the MP4 directly to Facebook to share it. Add a catchy caption that makes people want to comment, like and share it. Embed your YouTube link in your blog post. If your video does well initially, pay a few dollars to promote it, I typically do $5 per video. This will expose it to more people and leave you with more engaged fans for the rest of your posts. This is how I create all of my videos, but it works particularlly well for short craft tutorials. I hope you can take something away from this that will help you take your video making and editing to the next level. Tell me where you are with video and blogging? What successes or challenges have you had? Take a look at some of my Facebook and Instagram videos. Below is one of my favorites that gets shares daily without much promotion. In need of an adorable and crafty baby gift? What Mommy-to-be wouldn’t love this set of Onesie Cupcakes? Thank you, Sarah for sharing this wonderful post and tutorial. I love and enjoy all of the videos you have made so far. I need to start making videos. Pinned. Thanks for the tips Sarah… I didn’t know that videos without voice were popular…that helps a ton! Awesome post….thanks for sharing! I’ve been wanting to delve into the video space for quite some time now, especially after seeing many of the videos you’ve posted on your blog! They make tutorials so much easier to envision and understand/follow! This will come in handy big time 🙂 This gives me motivation to get started! Thank you for such a sweet comment, so glad you found it helpful!